The New Brunswick Anti-Shale Gas Alliance and three citizens are suing the provincial government over plans to develop the industry in New Brunswick. The alliance, which represents 22 community organizations, and the three other plaintiffs, filed a notice of action and statement of claim with the Court of Queen's Bench in Saint John on Monday, alleging Charter of Rights and Freedoms violations. The New Brunswick Anti-Shale Gas Alliance has filed a notice of action against the provincial government. (Jessica Doria-Brown/CBC)​They are calling for a moratorium on the development of "unconventional oil and gas exploration" until the government can establish "beyond a reasonable doubt and with scientific certainty … that it will not contribute to climate change, nor to the contamination of the water, air and land use which causes harm to the health of the plaintiffs and their future generations." Meanwhile, they contend the government should divert the social, political and economic resources currently at its disposal for unconventional oil and gas development into an energy supply system that is based upon renewable energy sources instead. The provincial government has 20 days to respond. The group hinted during a news conference in Moncton on Monday that additional lawsuits against the province by other groups may be on the horizon, but declined to elaborate. The documents filed with the court cite concerns about hydraulic fracturing, alleging the process causes "serious harm to both the environment and human health," including "permanently contaminating and depleting finite clean water and air supplies for both present and future generations." Hydraulic fracturing, also known as hydro-fracking, involves injecting a mixture of water, air and chemicals into the earth under high pressure to fracture shale rock and release gas trapped within the rock formations. Opponents of the shale gas industry have long argued the hydro-fracking process can cause water and air pollution. "All life, including human, animal and plant life is impossible without clean uncontaminated water and air," the alliance, James David Emberger, of Taymouth, Roy L. Ries, of Harvey, and Carol Ann Ring, of Rothesay, state. The 16-page statement of claim also outlines concerns about leaks, spills, illegal dumping of waste water, and a disruption to rural life. "The cumulative, negative effects on rural people's mental health, due to increased stress, anxiety, fear and depression, leads to physical health problems," the document states. Emberger says the group has tried everything to get the attention of the provincial government, including petitions, demonstrations, debates and meetings. But the Alward government has rejected repeated calls for a moratorium on shale gas, he said. The group has now raised $100,000 through individual donors and hopes to prove to the province that shale gas extraction can cause cancer, birth defects and respiratory problems. Larry Kowalchuk, who represents the group, says the government has violated the Charter rights of New Brunswickers to life, liberty and security by moving forward with shale gas exploration without consulting citizens. "This is a free and democratic society. The Charter is important. These topics are critical now," he said. SWN Resources Canada intends to drill four exploratory wells next year in the next phase of its exploration program for potential shale gas development in New Brunswick. 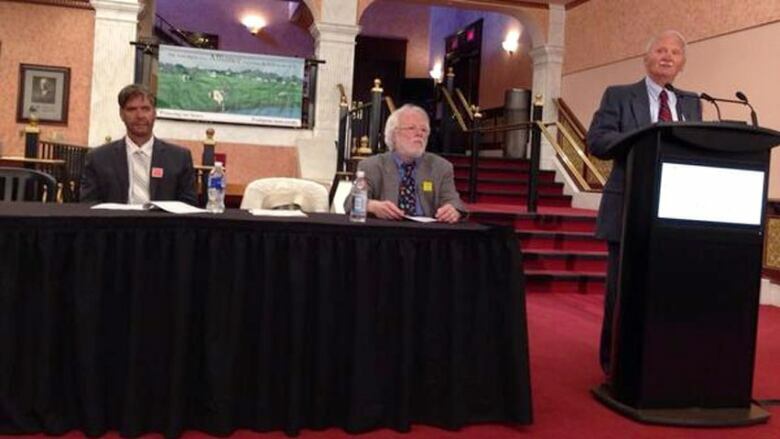 Two of the exploratory wells are planned for Kent County, in Saint-Charles and Galloway. The other two are planned for Queens County, in the vicinity of Bronston Settlement Road and the Pangburn area. Last month, a report by 14 international experts, commissioned by Environment Canada, concluded "data about potential environmental impacts are neither sufficient nor conclusive." The prospect of shale gas development in New Brunswick has sparked protests across the province. A protest along Highway 11 near Rexton on Oct. 17 ended in a violent clash with police. Six RCMP vehicles were set on fire and about 40 protesters were arrested.